The original series (who remembers "Spider-Man, Spider-Man, does whatever a spider can ... Can he swing on a thread, take a look overhead." etc? ), first shown on ITV in 1967, was constructed of individual stories, often involving common criminals, as opposed to costumed power-crazy or sociopathic villains. 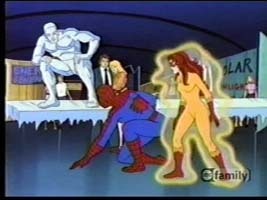 Spider-Man and his Amazing Friends (BBC 1, 1983), although popular, was generally light-hearted, the protagonist being aided in his endeavours by Bobby Drake as Iceman and Angelica Jones as Firestar. Together they annoyingly shouted "Spider Friends ... Go for it!" at every opportunity. This, combined with the living-room which conveniently transformed into a computer-laden operations room ... and a nauseatingly cute dog, meant it obviously wasn't supposed to be taken too seriously. A lesser known version which ran to only sixteen episodes was Spiderwoman (ITV, 1983), a team-up between Spider-Man and the new, short-lived character. Screened in the UK in the mid-nineties (11:00 on BBC 1 every Saturday, and twice-weekly on Sky One), there are two main reasons why this Fox adaptation is so superior to those previous efforts. The first is the improved conventional animation techniques combined with computer-generated 3-D imagery. Sequences involving Spider-Man or a helicopter moving between buildings is extremely impressive. One such example shows movement, smooth and camera-like across water towards shore, where the skyscrapers are reflected on the surface. Secondly and more significantly, there is greater storyline continuity than ever before, which brings the teenage lead's agonies closer to casual audience understanding. Before elaborating the importance of this further, a brief background explanation is called for. 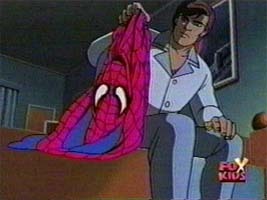 Peter Parker is an ordinary but scientifically gifted teenager who is accidentally bitten by a radiation-infected spider during a university experiment, giving him the proportionate strength and abilities of an arachnid. Although previously weak and often oppressed, he cannot display his new-found physique for fear of inadvertently revealing his secret identity. 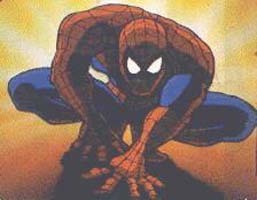 What makes Spider-Man unique (at least at the time of his creation by Marvel's Stan Lee in 1962) and relatable is that instead of helping to change his life for the better, as with the majority of superheroes, the acquisition makes his private life a miserable existence of missed opportunities. He is even forced the hard way to channel his abilities to fight crime - after his failure to intervene in a robbery results in the death of his Uncle Ben at the hands of the same perpetrator. Ultimately, he doesn't always make the right decisions, but his motives are dictated by what he feels is right. To cover this insecurity and general bad luck is the irrepressible humour, faithfully carried over from the comic books. In strict contrast to D.C.'s Batman, who is dark and moody and hardly says a word, Spider-Man never shuts up. The relentless quips, rather than becoming tiresome, are a constant amusement for the viewer - if not the respective villains. 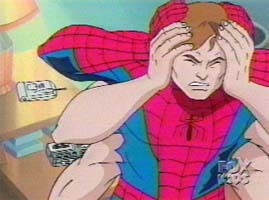 The Peter Parker of this series is nineteen. Whilst beyond his naïve bookworm school days when no female would benefit him with a second glance, he remains partially insecure unsuccessfully balancing his private life with amateur but effective policing commitments. Realism dictates that it's impossible to win every fight; sometimes subterfuge is necessary - or help from other quarters such as Nick Fury and his S.H.I.E.L.D. organisation, or in one case Professor Xavier's X-Men. There's no doubt that Marvel was fully committed to doing justice to the hard-hitting stories of recent years. 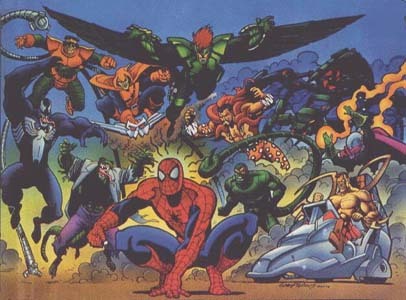 All the favourite reprobates raise their ugly but colourful heads: Smythe and the Spider Slayers, the Hobgoblin, Venom, the Scorpion, the Vulture, the Chameleon, Kraven the Hunter and, of course, Doctor Octopus. In fact the history of these characters means that twenty-minute stories seldom flesh them out as sufficiently as they deserve. This setback is partially rectified by having major storylines running to several episodes. The relating or peripheral characters are believable in that they highlight real problems. The editor of the Daily Bugle, where Parker sells pictures of Spider-Man tackling criminals, is a loudmouthed extrovert who purposely underpays for the headlining snaps and despises Spider-Man with a passion - even financing the powers of the Scorpion purely to see the web-slinger publicly humiliated. But more interesting is the on/off relationship with Felicia Hardy (later to become the Black Cat) and Mary Jane Watson (aspiring actress and model). Regularly Parker is forced to make excuses to get away, and often arrives late or fails to materialise at all for prearranged dates, driving his personal relationships further apart. Most of the stories are variations on basic established pieces, and the science therein is fundamentally contrived. However, dotted among these are some outstanding tales. The Saga of the Alien Costume, which ran for seven years in the comics, is contained in only three parts here and Venom (a relatively new and enduring villain, compared with Doc. Oc. and others) is first seen and ultimately dispatched in the final part of the trilogy. In this instance it makes for a breakneck-pace rollercoaster ride. 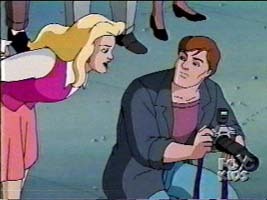 The Neogenic Nightmare saga contains more than a dozen episodes telling the story of Spider-Man's mutation and his attempts to reverse the process. At one stage he even sprouts extra arms and then becomes Man Spider. Of course, along the way we are introduced to other Marvel characters such as the vigilante the Punisher, Morbius the vampire, and Blade the vampire hunter. 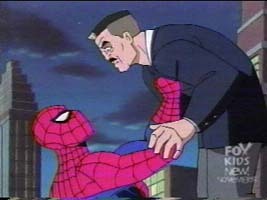 The web-slinger is periodically aided by Dr. Curt Connors (a.k.a. the Lizard) and his Neogenic Recombinator machine. In conclusion then: the scripts are relatively tight; the animation, whilst not in the league of most Japanese Manga releases (the overseas Animation House is Tokyo Movie Shinsha), remains several notches above average - particularly the computer generated backgrounds; and the action is frantic, sometimes a little too hectic. I have great respect for this character from my childhood, and this is certainly the best screen adaptation of the myth thus far (I won't mention the seventies live action series - oops, I just did!). It certainly helped fill the gap before the arrival of the long-awaited live action movie. Selective stories are available on video. In particular, look out for The Venom Saga (now also on DVD), which is both fast and funny, and includes a short documentary with Stan Lee talking about the origin of Spidey in the comics.